India's secularism is strong and it will not shake, Prime Minister Narendra Modi said in his address to the Indian community in Berlin. Addressing a community reception hosted by the Indian ambassador, the prime minister said: "India's secularism is not so weak that it will crumble. 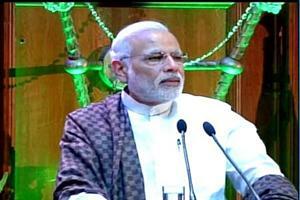 Our secularism is strong, and it will not shake; our self confidence should also not shake," he said. He also said that India will set the agenda for the climate change summit in Paris this year.